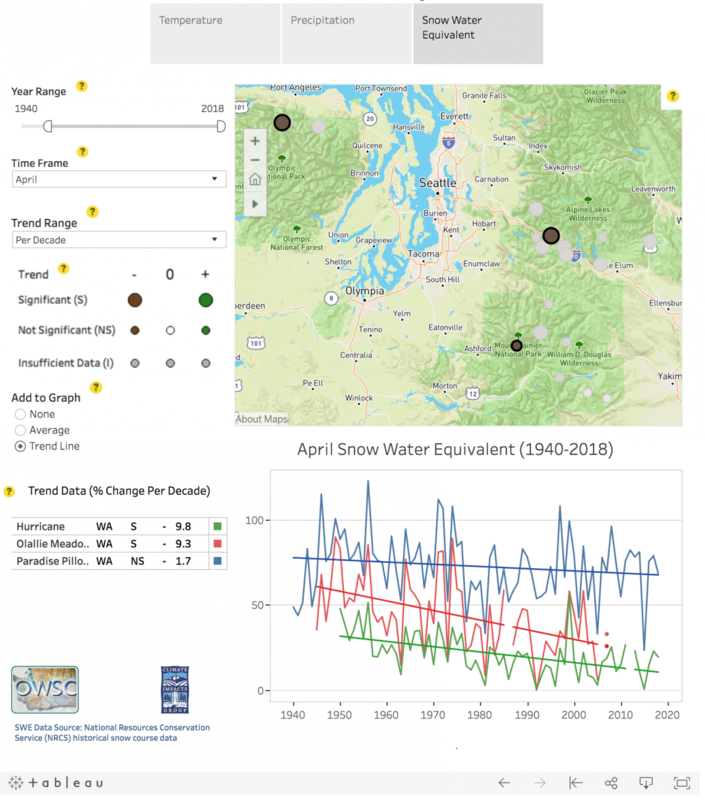 The University of Washington’s College of the Environment has teamed up with Seattle visual analytics company Tableau Software to create a new, interactive visualization for historical observations of temperature and precipitation in Washington, Oregon, Idaho and western Montana, and for Washington snowpack. The free online tool lets anybody interact with the records going back as far as 1881 and look for significant trends. 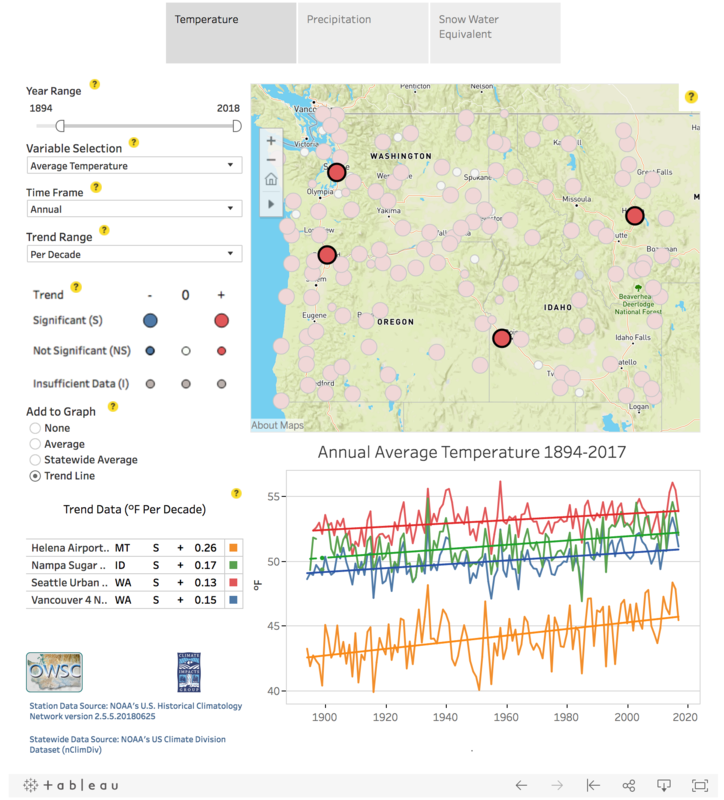 “This tool lets anyone, from researchers to meteorologists to members of the public, look at the actual data to motivate why we should care about our climate changing, and see how it is changing in our own backyard,” said project lead Karin Bumbaco, the assistant state climatologist for Washington. The tool uses Tableau’s interactive visual analytics platform to select one or several National Oceanic and Atmospheric Administration stations in the Pacific Northwest, plot the trend and play around with time periods, seasons and other variables. A previous version of the tool ran on Google Maps and was the most popular feature on the state climatologist’s website. But it sometimes crashed and it was cumbersome to load new weather observations, so it was updated infrequently. The new tool was created in the summer of 2018 when the UW Climate Impacts Group and Office of the State Climatologist hired UW atmospheric sciences alumnus Matt Rogers to migrate the tool from Google Maps to Tableau. The new platform launched in September is more visually appealing, more stable and is easier to update, with plans to update observation records every few months. Users can access it to easily explore the data for their city or region, and produce graphics that display the data and any significant trends. The tool displays quality-controlled records of temperature and precipitation beginning in the late 1800s. These data are a subset of federal weather observations, known as the U.S. Historical Climatology Network, which includes the best-located stations with the longest records the agency recommends using to look at climate trends. On the map, stations with an increasing temperature trend show up as a red bubble, and decreases are blue. A statistically significant increase gets a big red bubble, while a statistically significant decrease gets a big blue bubble. For temperature, the map is filled with big, red bubbles. Are those trends the impacts of climate change in the Pacific Northwest? “Definitely,” said Bumbaco, who is also a research scientist at the UW’s Joint Institute for the Study of the Atmosphere and Ocean. The most striking trends are in summer nighttime temperatures, the daily minimums, which she says are increasing across the region. The team surveyed other state climatologists, on-air meteorologists and other potential users in the region to get feedback when creating the tool. People can use the map’s navigation button to zoom in or out, and then click a triangular button below to access buttons that select regions of the map. Clicking on a single station pops up a summary of its data and creates a line graph below that shows each year’s observations over time. Clicking several stations compares those observations. Tools at the left can have the popup window show changes over the entire period of observations, per year or per decade. Users also can add a trend line to the line graph, add an average value, or compare a location with the statewide average. The tool gently encourages users to display statistically significant trends by showing a gray color if the time period is shorter than 30 years, considered the minimum for a climate trend. Along the bottom of the screen are buttons that let users download, export or email their visualizations. 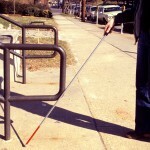 Dan Cory, a technical advisor at Tableau who helped create the tool, said the ongoing collaboration allows him to learn more about how to visualize unique datasets and help people create user-friendly interfaces. The tool also includes snow-water equivalent, a measure that takes density into account, for Washington state beginning in 1930 from the federal Natural Resource Conservation Service sites. The snow observations are best for April and show decreases in many parts of the state. Precipitation in the Pacific Northwest doesn’t show a clear trend, though many areas show wetter springs, Bumbaco said. The Climate Impacts Group has been working with Tableau since 2016 to create other, more forward-looking tools, such as a future precipitation changes, or projected changes in streamflow around Leavenworth, Washington. The partnership with the Office of the State Climatologist creates consistent and common visualization tool for the two groups. 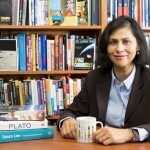 “Our collaboration with Tableau has helped us to consider everything from what colors you use and how thick should the lines be, to addressing bigger issues, like where you start with a visualization, how users navigate through it, and what information users need to navigate it successfully,” Roop said. 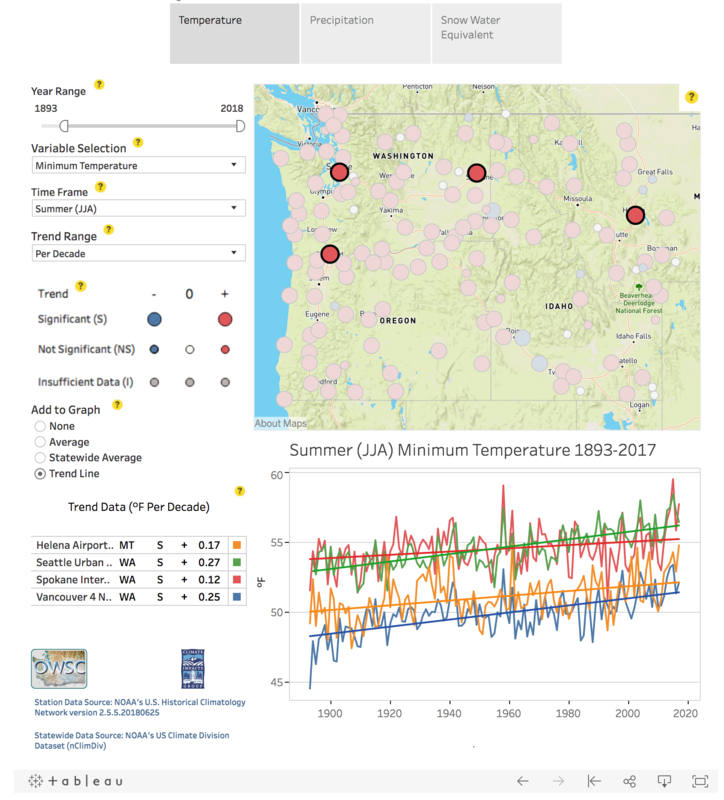 The updated Pacific Northwest climate trends analysis tool is open source, so other regions of the U.S. or other countries could potentially use it to display their historical observations using the same Tableau interface. 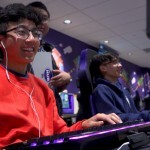 For more information, contact Bumbaco at kbumbaco@uw.edu or 206-543-3145, and Roop at hroop@uw.edu. For Tableau communications, contact Dan Jensen at djensen@tableau.com. More example visualizations are here.